Leaders of Jatiya Oikya Front have agreed to take part in the 11th National Election slated for Dec 23. The decision came from a meeting of the alliance’s Steering Committee late on Saturday (Nov 10) at the BNP chief’s offices at Dhaka’s Gulshan. The coalition, however, will continue with its movement to press for its seven-point demands to ensure a free, fair and credible election, three people who sit on the steering committee told Bangla Tribune. The formal announcement will be made at a press conference on Sunday (Nov 11), according to Oikya Front leaders. 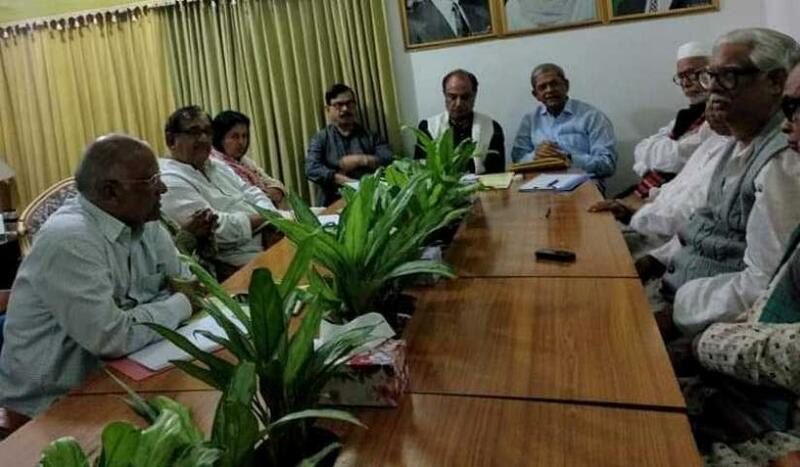 According to people familiar with the meeting’s discussion, BNP Secretary General Mirza Fakhrul Islam Alamgir sough the allies’ opinions on joining the polls, when representatives of Ganor Forum, Jatiya Samajtantrik Dal (JSD), Nagorik Oikya and Bangladesh Kriskah Sramik Janata League gave their green lights. Pro-BNP professionals’ leader Zafrullah Chowdhury told Bangla Tribune, “We are all in favour of contesting the election. Several matters were discussed. It will be formally announced in a media briefing tomorrow." The newly formed alliance have decided to write to the Election Commission (EC) urging to ensure level playing field for all parties and candidates seeking to contest in the polls, said a leader of the Front and added that the letter will be sent to the EC on Nov 12. They will also call on the EC to take necessary steps to postpone the polls-schedule, create equal opportunity for all, withdraw politically motivated cases and put an end to indiscriminate arrests and harassment, said the leader. Most of the leaders spoke in favour of participating in the polls, said the Front’s leaders following the two hours Saturday meeting that ended around 11pm. “The very aim of a democratic movement is to ensure fair polls and we believe in the election,” Abdul Malek Ratan, a key leader of the Front told Bangla Tribune. “However, the ruling quarters won’t be able to influence votes on all 300 seats,” he added. Oikyo Front chief Dr Kamal Hossain will make the official announcement of the Front’s decision on participating in the national polls on Sunday’s (Nov 11) media brief, said the coalition leaders. Nagorik Oikya, the only unregistered party of the Alliance, has primarily decided to contest with the BNP’s electoral symbol, people familiar with Saturday’s meeting said.